Brian Rodgers Jr. of Digital Art That Rocks™ shows you how to create realistic looking steam from scratch, right inside of Photoshop CC! His unique approach will have you creating realistic steam in no time! As a retoucher, one of the things that I love about Photoshop is the ability to create things from scratch. Recently I was shooting a commercial product assignment and I had a cup of coffee in the background as a prop. It really added to the image, but it was by no means the focal point of the image. By the time I had everything right where I wanted it on set, the coffee was cold and no longer had real steam. Instead of brewing more coffee, as I had drank enough already that day, I decided it would be best to create it in Photoshop. I tried a few a few things first before ultimately coming up with a really cool and repeatable technique. I tried creating some custom brushes, and I got some pretty good results, but it was taking way too long to do it with the brush tool. So after about 10 minutes of experimenting, I developed a really cool technique that allows you to create realistic looking steam in just minutes! It utilizes one of Photoshop CC's new features. Check out the video to see how it works! As of last week, Adobe is pulling Adobe Photoshop Touch from the App Store, Google Play Store and other digital platforms. Why? Check out this video that was released yesterday by Adobe Photoshop Product Manager, Bryan O'Neil Hughes. He demonstrates a prototype of some new software they are developing for mobile devices. The techniques in this video are nothing we haven't seen on a desktop computer. However, that said, the ability to retouch a 50 megapixel file from a Canon 5DS on a tablet, is nothing short of impressive as hell. There have been some pretty good mobile retouching apps on the market such as Snapseed but this Adobe Prototype is the closest thing I've seen to something a professional would actually use in a real world workflow. There is no doubt, that Adobe is using technology that hints toward a eventual full blown version of Photoshop on mobile devices in the future. If you are a Creative Cloud subscriber, you may already be aware that Adobe offers several mobile apps for iOS, and a very small handful of Android Apps i.e. Lightroom Mobile, Behance etc. I have no doubt that they will be developing this prototype for iOS. No word yet on development for Android as far as I know. Though I wouldn't be surprised if they were developing this for Android as well. Adobe & Google formed a partnership that introduced "Project Photoshop Streaming" to a small group of beta testers last year in 2014. Selected participants are able to access Photoshop on their Chromebooks! You read that correctly, on their Chromebooks. Photoshop Streaming works directly with Google Drive, which is where you would store your Photoshop files; in the cloud. This means that Adobe is in the early stages of what's to come with mobile based cloud computing. Mobile applications are increasing in functionality & popularity on a daily basis. Such as the apps that run on Google Chromebooks or in the Chrome browser. My prediction is that in the future, Adobe will have the entire Creative Cloud available in a web app based environment. So no matter what operating system or device you are using iOS, Android, Linux, mobile phone, tablet, computer ect. You will be able to use Adobe Software via the Creative Cloud subscription. As long as you have a web browser and an internet connection, you would have access to the software. This would mean more dependency on faster internet speeds (hence Google Fiber) but more than likely, less demand on your computer's actual hardware specs. From my understanding, a lot of the algorithms (or math) going on behind the scenes are actually being performed by a server somewhere, not necessarily on your device; meaning the faster your internet speeds, the faster the results. So in other words, if you were going to run a filter in Photoshop, your device wouldn't necessarily be computing the filter, but rather an Adobe Server would be. Your device would simply be the catalyst for making that connection. I think mobile adobe applications like the prototype Bryan is demonstrating, are simply test applications in the grand scheme of things. They are pushing out bite sized mobile applications that push the use web technology that would later allow them to run an entire Creative Cloud subscription via an internet web app. So think of this prototype as only part of what the full blown web app version Photoshop could do. Let's think about this from a business perspective. It's no surprise that the internet of things has changed business' all around the world for better or worse. Entire industries have crumbled and simultaneously thrived. Take the music industry for example. Napster single handedly changed the music industry forever. No longer, did people go out and buy albums. Instead, they got it for free on the internet. This crushed revenue for an entire industry. Major record companies went out of business. Not only did it hurt top record executives, it also hurt producers, sound engineers, and more importantly the artist's. There is still a lot up in the air at this point. Business' that previously never existed are now thriving. Take for example, the subscription based models used in music services like Google All Access Music, Spotify, and Pandora. A monthly fee let's you listen to unlimited music, all through internet access. However, you don't own a copy of the music like you did when you bought a cd. Once you stop paying for that service, you no longer have access to that music. Take a look at another business model like Pledge Music. Pledge music is sort of like a Kickstarter campaign for musicians. Bands and the like, can fund their projects by setting prices on rare items like $7,500 to have the band play an acoustic set at your next backyard bbq, or as simple as a signed album once it's released. There's no doubt that old business models will eventually die and new business models will be formed. Such as the case of Adobe. If Adobe is able to make this web based app environment possible, then this may suggest that, eventually future applications would no longer be a downloadable source for your physical hard drive. This could in essence, this could prevent unpaid subscribers from stealing their software, which has been a problem in the software industry since the birth of file sharing through the internet. Adobe has been doing a great job of not only giving customers a ton of value for their money by switching to the Creative Cloud, but adapting at a pace in which most consumers of Adobe products favor their cloud based services. I believe that in the future, many software companies will eventually release software in the form of a web based app, as opposed a physical download to your device. Which may or may not be a good thing, that's for the individual user should decide. However, most consumers don't particularly enjoy seeing a notification that their phone has 10 software updates available at any given time. Web based applications would be updated in the background without the user ever needing to manually update. This is the beginning of a new Google Series that I will be writing about. This series of articles will talk about how I use Google services as a commercial photographer based in South Bend, Indiana. Please note, that I am not being paid by Google to sell services, these articles will be derived from an informational standpoint stemmed from my own thoughts and opinions on how I use these services in my own personal workflow as a commercial photographer. Lastly, in order to use these services, you will need to sign up for a free google account, if you already have a gmail account, then you have a google account. Let's start off by talking about what Google Drive is. Simply put, Google Drive a free cloud storage service that lets you store and access your files anywhere, on the web, on your computers hard drive, or on your mobile device, by downloading Google Drive app and using your Google Account. You can also go to https://support.google.com/drive/answer/2424384?hl=en to find out more about Google Drive in full detail. With Google Drive, you get a generous 15GB of free storage for any types of file(s) you'd like to access. In addition, creating and using Google Docs, do not count against your 15GB limit. Now lets say, you start using Google Drive a lot, and you need more space. No problem, they offer additional cloud storage tiers for very reasonable prices; the best I've seen on the web actually. As of today's date, you can get 100GB for $4.99 a month up to 16TB for $800 a month, now that's going way overboard for cloud storage for about 99.9% of the population, but you get the point. The interface is pretty self explanatory if you're familiar with web technology in general. It's easy to navigate, clean and functions just like any file folder on the hard drive of your computer. 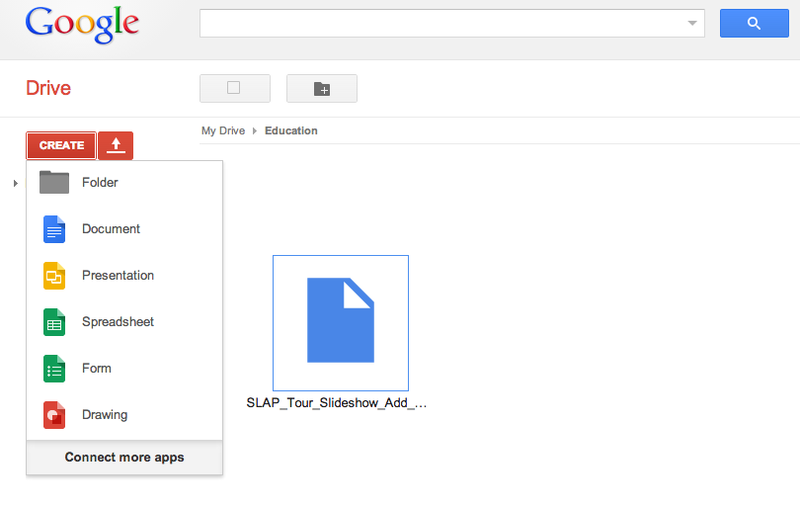 Speaking of file folders on your computer, by installing Google Drive on your Mac or PC it creates a folder called Google Drive. Anything you put inside that folder will be uploaded/synced to your Google Drive automatically and vice versa. This means that when you log into your Google Drive account via the web, you will see a mirror image of what you have stored in your Google Drive Folder on your computer. This is really convenient! It's similar to having an iMap email account; it's mirrored. So if you delete and email, it's reflected on all devices you have that email set up on. Google Drive works the same way. How else could a commercial photographer use Google Drive? I'm glad you asked! You can also use it to create documents; Google Docs to be exact. You can create word docs, presentations, spreadsheets, forms and even drawings. I personally enjoy the fact, that I can create a word document and store it in the cloud so I can access it anywhere. Lets say that I need to come up with a rental gear list for an upcoming shoot. I can start a new Word Doc inside Google Drive, while at the office, and call it "Gear Rental List for Upcoming Shoot," save it in the desired folder, and continue working on it from home later that night if I need to add anything else. Maybe you're putting a bid in on a job and you need to specifically outline the cost of shooting that job. You can simply create a new word doc, and start typing away, no need to own a copy of Microsoft Office. You get it for free with Google Drive! You can also track expenses, mileage etc by creating a spreadsheet. The possibilities are limitless. Another great thing about using Google Docs, is the ability to convert these files to industry standard formats. For example, lets say I need to email the "Gear Rental List for Upcoming Shoot" to another person, but they use Microsoft Office. Simply go to File > Download As > Microsoft Word. It's that easy! Now you have a word document that you can send someone else to add or make changes to. You can also create a PDF if need be. This also works with Spreadsheets. You can export a file to work directly with Mircrosoft Excel. Prior to using Photoshop CC (Creative Cloud), I would keep my Photoshop and Lightroom settings in Google Drive. That way, when I would be at home creating an action, or creating any kind of presets, I could keep a copy in Google Drive not only for backup, but to add to my computer at the office. (I will continue to use this process for Adobe Lightroom 5 at this time). Plus it's always great to have a backup copy of all of your develop module presets….just incase. Now lets talk about file delivery. Lets say you want to deliver final files to a client, or colleague. (You may already have your own methods i.e. FTP, You Send It etc. No problem, this is just my suggestion.) You can do this by simply right clicking on a file and either emailing as an attachment, or if it's a large file, selecting "Share" and typing their email address. You can also specify what kind of permissions you would like to give them; Edit, Comment, or View. When you give them permission to "Edit" this will display a download button. If you are trying to deliver downloadable files to a client or colleague, this is what you want to select. 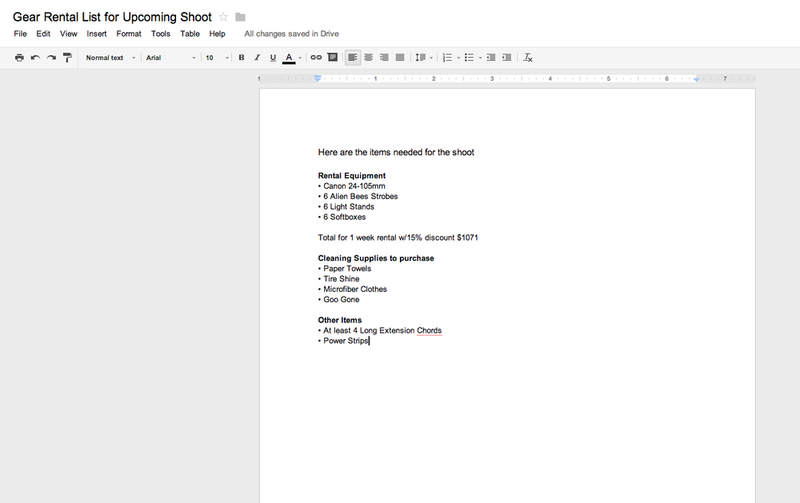 These are just some of the ways that I use Google Drive for my Commercial Photography needs. I'm sure this service will evolve over time and become an even better tool for storing files, as well as sharing and collaborating with others. I hope this helps inspire you to embrace and use technology in a way that you may not have thought possible. I'm sure you too will come up with your own unique ways of using Google Drive.